Central Coast Taxis - Theft, Fraud and Playing The Game. I've long been a frequent central coast taxi user, hence I know about 80% of the drivers well. So im in a great position to discuss what's really going on behind the scenes. As of last year there has been a rather steep decline in people using the Central Coast Taxi service. Some of the drivers you talk to will tell you that it's because of the flood of "Indian" and "Ethnic" drivers, but I know this to be not true. The decline has been due to market changes and people voting with their feet about the horrendous service that the Central Coast Taxi drivers have long provided and it is not just "Indian" and "Ethnic" drivers, I've had my fair share of Aussie taxi drivers too. The situation gets worse, try making a complaint about a driver or the service and nothing is done and no response provided. 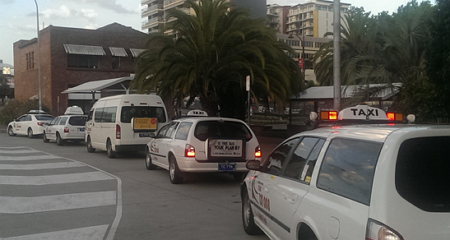 If you place a complaint on the Central Coast Taxi Facebook page the complaint will be removed. That's why we created the Central Coast Taxi Complaint Facebook page, to allow community members to get complaints out into the public and at least stand a chance of something being done. If you feel you are being scammed by a taxi driver, simply call 131 008 while in the taxi and get it sorted out immediately. Remember if you had no money to pay them, they would drive you to the Police station. Keep an eye out for taxi drivers that obscure their identification, it must be displayed clearly at all times. Another thing that is being done that has serious affects on the quality of service is that drivers will accept your job, wait 5 minutes to see if something else better comes along and if something does they reject your job placing you back in the queue. Job queuing is another issue, where a taxi driver will accept a few jobs all at once and than rush to get each trip completed. The rules are that the driver must be able to get to you within 10 minutes of accepting the job. This has resulted in many complaints by passengers being scared for their lives as the driver is speeding and driving erratically, i've even seen a complaint where the passengers asked to go to McDonalds drive through before going to their destination, only to be told by the driver "No, I don't have time for that". What the hell.. you, the passenger are paying for their time and have a right to detour. Exercise your rights, you are being recorded in case you do something wrong. It's now your turn to record them. If you intend on using the recording for legal purposes you must tell them that they are being recorded and get this on the recording as evidence. They cannot tell you that you cannot record them, it is your right.